A small group of protesters are blaming Vancouver-area traffic jams on immigration. 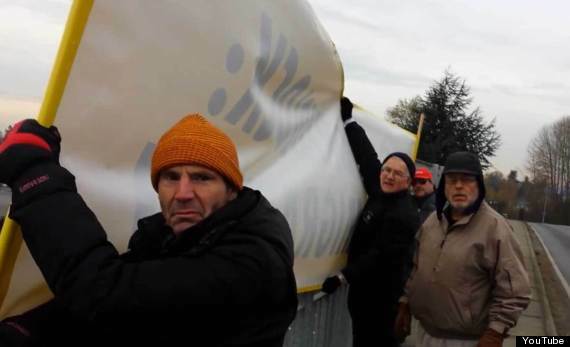 About half a dozen men stood on the Blundell overpass in Richmond on Wednesday morning and held up a bright yellow banner above Highway 99 that read "Fight Gridlock: Cut Immigration." "More people, more cars,” Dan Murray, one of the protesters and a spokesman for Immigration Watch Canada (IWC), told the Richmond News. "Every two people who come in as immigrants bring another car onto the road. That’s how it works." RCMP received several complaints about the demonstration. "We were shocked and offended. It was just such a transparent attempt to play off peoples’ frustrations about traffic to stir up resentment against the immigrant population," Eron Main told The Huffington Post B.C. in an email. Main spotted the banner as he was driving his wife to work and his kids to daycare. On his way back, he decided to stop and investigate because the sign did not identify who was behind the protest. "I felt very strongly that their message was negative, that it was bad for the community, and that it didn't reflect my values or the values of this community. I wanted to know who these people were," explained Main, who lives in nearby Ladner.